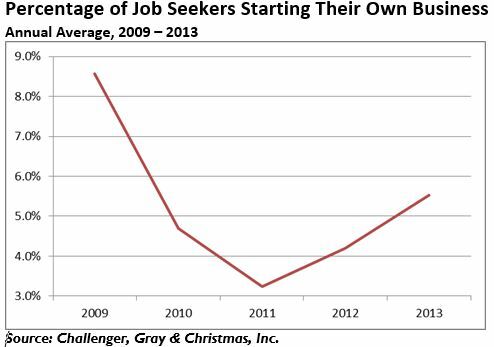 Start-Up Activity Increased 31 Percent in 2013 | Challenger, Gray & Christmas, Inc. The percentage of former managers and executives starting their own business rose in 2013 to its highest level since the end of the recession, according to a new survey. The increase in entrepreneurial activity among displaced professionals belies recent trends in the wider labor force where the number of self-employed Americans declined last year. On average, 5.5 percent of jobless managers and executives started their own business each quarter in 2013, according to a survey of job seekers finding employment by global outplacement and coaching consultancy Challenger, Gray & Christmas, Inc. The average start-up rate in 2013 was up 31 percent from 2012, when 4.2 percent of these job seekers launched their own enterprises. In 2011, the start-up rate averaged just 3.2 percent over four quarters. “In the wake of the recession, we saw start-up activity among job seekers drop to some of the lowest levels on record. This was undoubtedly due to a dire lack of confidence; not only in one’s ability to build a client base, but also in one’s ability to find traditional employment if the business venture fails. We are finally getting back to a point where aspiring entrepreneurs have more confidence in both of these areas,” said John A. Challenger, chief executive officer of Challenger, Gray & Christmas. The increase in start-up activity among job-seeking managers and executives bucks the general trend in the labor force, at large, where self-employment has declined. The latest household survey from the Bureau of Labor Statistics shows that the number of Americans who were self-employed in non-agricultural industries fell by an average of 94,000 per month in 2013. There were 8,953,000 self-employed workers in December 2012. By December 2013, that number stood at 8,506,000. “For many people, self-employment is a last resort when traditional employment is unattainable. As the job market improved throughout 2013, many self-employed Americans are likely to have moved back into the workforce. Some may have been independent freelancers or contract workers who were officially hired by the company where they were previously contracted,” said Challenger. “For the managers and executives in our survey pool, self-employment is rarely the option of last resort. The respondents are those who lost their previous positions through downsizing. Many were higher-level managers and executives in the latter half of their careers. So, for these individuals, starting a business stems partly from a desire to not have one’s employment fate in the hands of another company. For many, it is the fulfillment of long-time goal of being an entrepreneur. For others, it represents the third act of their professional lives,” said Challenger.